The Latest Popular Necklaces Designs! A necklace is one of the most sophisticated and elegant pieces of jewelry a woman has in her collection. A timeless favorite of the red carpet, a necklace not only holds the ability to complete a look but adds to it as well. It is the most captivating and exciting part of any attire, usually so seductive that you choose the outfit based on the necklace. However, with such a wide variety of classic, beautiful necklace designs available, choosing the right necklace becomes a difficult decision. To make this decision a bit easier, following are some of the most popular necklace designs which are sure to inspire you! Are there different lengths of necklace designs? Before we get to popular necklace designs, it is essential to know the different lengths of necklaces. Although over 30 million people buy fine jewellery in the US, most of them do not know about different lengths of necklaces available. Understanding the different lengths can make purchasing the right necklace a whole lot easier. When you know the right length, you can choose and match it with the correct design, making the decision a lot easier. High-quality chains are an essential part of every jewelry collection. The most popular options include gold and sterling silver, but lately, gold vermeil is becoming increasingly popular in both consumers and exclusive jewelry designers. However, the problem with fixed-length chains is that it’s almost impossible to get the perfect length without purchasing a few chains in different lengths and sizes first. The adjustable-length chains put an end to this frustration, giving endless possibilities and allowing you to find the perfect length for every occasion and outfit! Dating back centuries, the Festoon necklace design is inspired by Festoons initially worn in Ancient Greece. Originating in Greece, a festoon is a garland or wreath of woven flowers, branches, and leaves. The Festoon necklace mirrors this in its design, comprising of threads of chain and various other elements and details which are then interwoven into an elegant and draping necklace.Although the Festoon necklace dates back to ancient times, it is still an essential part and design of the modern everyday wardrobe. Festoon necklace designs are often associated with pearls, gemstones, and precious metals. The lavalier necklace design was introduced at the start of the twentieth century. Comprising of a slender chain and a small pendant with decorative stones and other elements hanging at the end, the sleek, classic, and feminine style of the necklace is the reason behind its years of popularity.Several lavalier necklace designs also connect a large focal piece to a smaller chain, enhancing its beauty and elegance. This necklace goes best with a feminine, bohemian, or light fashion. The single strand pendant consists of either a gold or a silver chain with a single beautiful focal piece or element. This necklace is one of the most popular pieces today because of the versatility the pendant necklace adds to your wardrobe.With such a wide variety of pendants to choose from, the necklace can be one of the most elegant yet versatile pieces in your collection. You can choose a pendant which features a precious gem, a small charm, or any other element. The real beauty of a pendant necklace lies in its ability to be easily customized. You can personalize them with initials and send them as special gifts, or you can choose one which matches your birthstone without overpowering your wardrobe. This necklace design pairs best with casual dresses, t-shirts, and even with a simple sweater with jeans. These classic beaded designs like pearl necklaces and graduated necklaces are also hugely popular with modern-day fashionistas. Charm necklaces are very similar in style and design to traditional charm bracelets. The necklaces are not only popular as classic fashion accessories, but also as beautiful collectible gifts. A charm necklace generally gives a fun and casual feeling and consists of a wide array of charms which holds significance for the wearer. Charm necklace designs have recently increased in popularity because of the fashion trends set by exclusive designer companies like Pandora. You can even mix up different styles and try a vintage style charm necklace, for example, one with a 2000-year-old Roman Glass. A bib necklace features a wide array of different layered chains or a large, single element which covers up the entire breastbone. The latest variation of this design maintains the same layers of a bib but is more elegant in appearance. These exclusive necklace designs are immensely popular but are often expensive. No matter the occasion, this elegant necklace design is sure to leave a lasting impression, allowing you to stand out from the crowd. These bib necklace designs are usually worn as statement pieces with a formal wardrobe choice. The timeless princess necklaces are sure to make you stand out from the crowd because of their style and length. The length is a bit shorter than matinee necklaces but a little longer than the traditional choker. Its 18-inch length is widely considered to be one of the universal necklace lengths and one of the most beautiful. Princess necklaces are designed in such a way that the focal pieces or pendants hang just below the collarbone. This necklace design reflects elegance and class and features stunning rhinestones along with slender shapes and a single drop point. This sophisticated necklace design is perfect for formal events, but you can also pair it with a simple v-neck and blazer combination for work. Buying the most beautiful necklaces online! If you want to purchase necklaces online, The Jewellery Room is the perfect place to start! Featuring a wide selection of popular necklaces designed by innovative and creative Scandinavian jewelry designers, The Jewellery Room holds everything under one roof! It hosts a wide range of gold-plated, silver, rose gold, white gold, and gold necklaces. The beautiful pieces with untraditional expressions and playful symbols are to leave an impression! All necklaces are designed in a timeless and everlasting manner so you can wear them your whole life or can pass them on! What popular necklace designs does The Jewellery Room offer? One of the most popular necklaces today, the Intertwined is masterfully designed by By Pariah. Made using nine karat gold, the choker is effortlessly bold yet maintains a feminine look. The beautiful piece is everyone’s go-to choice, perfect for all occasions.The brand behind Intertwined was founded by two creative, ambitious minds – Robyn Kotze and Sophie Karg. Based in London, By Pariah is a jewelry and lifestyle brand. All their jewelry collections feature timeless, beautiful pieces with a particular edge which integrate beautifully into the modern wardrobe. Artful craftsmanship and high quality are the foundations of the brand, with all pieces having a clear, structured, and minimalist look. Another popular necklace is the letter necklace offered by The Jewellery Room. Designed by Carre Jewellery, the pendant necklace is made with 10k gold. It is available in a variety of letters and symbols, allowing you to personalize your necklace. Shiri Rosenzweig, the designer behind the simple yet beautiful necklace, has a deep love of precious stones. She is fascinated by pearls and gemstones and the rich array of colors they offer. She also believes that each piece speaks for itself in its own individual and characteristic way while maintaining the pure structure of precious stones at the same time. The Halo Pendant is one of the most beautiful and popular necklaces available today. 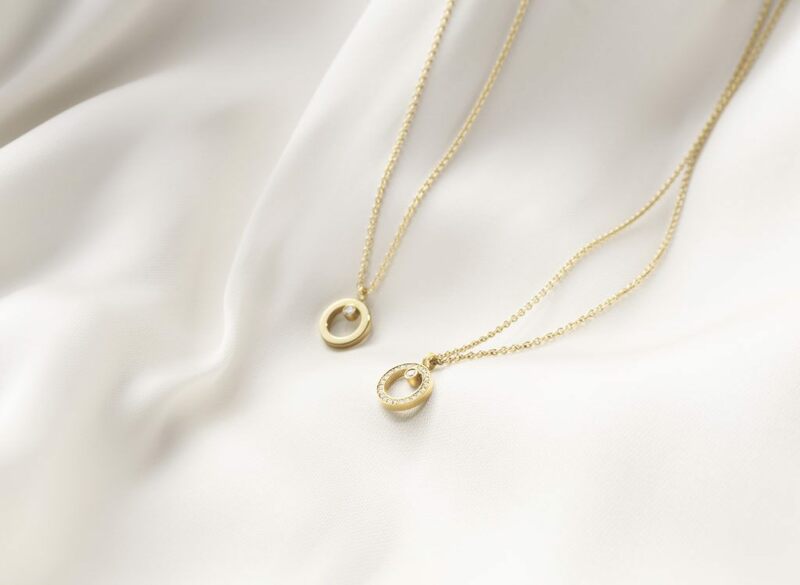 Made with 18 karats yellow gold, the pendant necklace is the perfect combination of simplicity, elegance, and sophistication. The precisely cut diamond further enhance its beauty and class. Georg Jensen, the brand behind the necklace, is the perfect representation of the timeless aesthetic design and quality craftsmanship. With a history dating back to more than a hundred years, the brand produces quality lifestyle products, ranging from home products and hollowware to watches and jewelry. The philosophy of Georg Jensen was to design pieces which possessed both beauty and functionality while his artistic talent and artisanal skill were the foundation of the brand.